It is by far one of the coolest “big kid toys” I’ve seen! And of course he looks super cute with his “leave me alone I’m concentrating” face on. 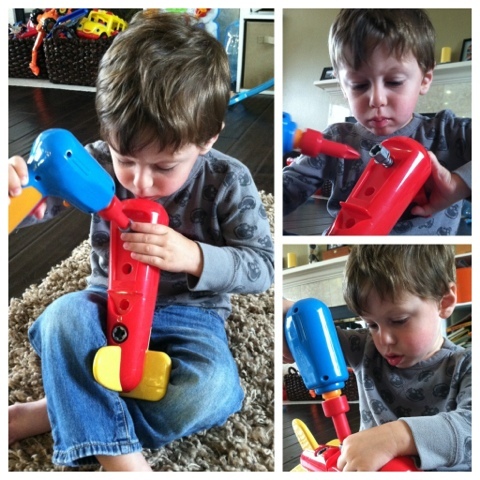 Perhaps he will be able to fix things better than like his Daddy does. 2. 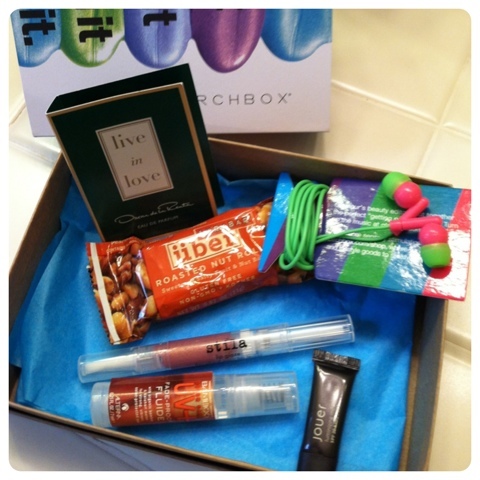 My Birchbox! It’s my little present to myself every month, and it is the best $10 I’ve ever spent! I’m a sucker for places like Sephora, but rarely have the time to leisurely spritz/gloss/rouge/bronze myself there anymore. So Birchbox is like having Sephora delivered to your mailbox each month. It’s silly embarassing how excited I get when this little box of frilly girly goodness and surprises arrives. And don’t tell Birchbox, but I’m secretly impressed with the swag that they’re sending. I got a full size Stila lipgloss this month, AND cool earbuds, AND a nice size tube of stuff that makes my hair shiny, AND a sample size perfume and a Lara Bar and a sample of tinted moisturizer…did I mention it’s only 10 bucks, and each month is a “suh-pwize” as Max would say? Mamas…get some goodness delivered to your door! 3. Max’s preschool is amazing. I just have to shout it from the rooftops. His summer camp teachers are warm, loving, kind, and full of energy that I am desperately lacking right now. He runs to the door to greet me when I come to pick him up, and every day he has a new art project or special treasure to show me. 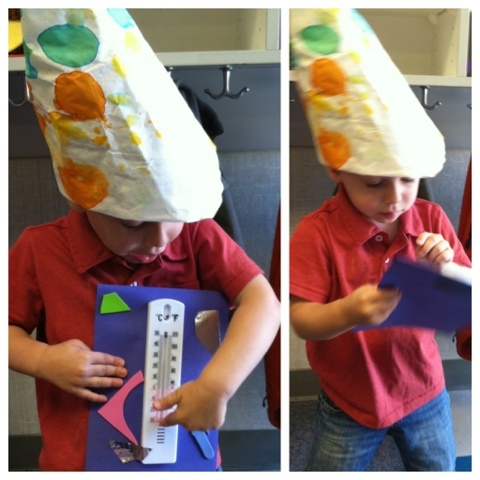 I love the community of friends and families that we’ve created there, and I am amazed every day by what he is learning….thermometers and science? Yes, he tried to explain it to me…. With his coffee filter hat on, of course. And then there’s this..
Max came home knowing how to say his full name. And that makes me cry happy, proud tears. It’s just another wonderful full circle moment I guess….when your kid can say their full name. It makes me warm and fuzzy inside, knowing that he can identify the family he belongs to. Of course he knows that already, he knows where he belongs. But hearing him SAY it? For the first time ever? LOVE. The name thing is pretty cool, huh? For the longest time Zaid would only say his first name so having him say both just makes me smile. (Although, yes, he does sometimes say his name when asked how old he is too, instead of two). I am loving his NOT NOW, MAMA, I’M WORKING face.